Stormont Angling Club is a private club established in 1981 by The Rt Hon Earl of Mansfield with fishing on Scone Palace Estates beats of the River Tay and River Almond. Membership is available to anglers residing anywhere but preference is given to those residing in the area. 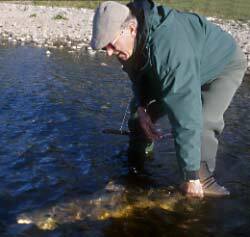 Members enjoy access to trout and grayling fishing on much of the lands owned by the Estate and in addition salmon fishing season permits are available on three beats of the River Tay and two beats of the River Almond by additional subscription. Salmon season permit numbers are limited and a waiting list system is in operation for those beats that are over subscribed. The fishing offered is excellent quality and good catches are made. The Club has been granted a new lease of its fishing which extends until 2033. A joining fee of £15 is charged to new members. Applications for membership of Stormont Angling Club should be send to The Secretary, Stormont AC, Scone Palace Estates Office, Scone Palace, Perth PH2 6BD or phone 01738 552308 for details and availability of membership. Season January 15 to October 15 with temporary season extension that currently allows fishing between October 15 and October 31 on a strict catch and release basis. Please note that there is no Sunday salmon fishing in Scotland. Shrimp and prawn fishing is illegal on the River Tay. The Club has strict codes of conduct to ensure that good fishing is enjoyed by all.